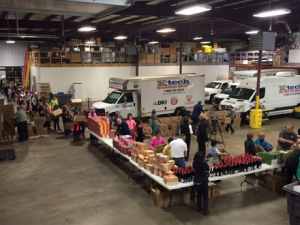 DKI, North America’s largest disaster restoration contracting organization, today announced that one of its member companies, K-tech Kleening Systems of Weston, Wis. will be giving back to those in need through their 15th annual holiday food basket program. Launched in 2000, the program initially assisted 20 different local families. This year, with the help of the 5th grade class at DC Everest Evergreen Elementary, 400 holiday food baskets have been assembled. On Sunday, December 20, K-tech Charities and several volunteers will distribute the food baskets to prequalified local families in need. “The holiday food basket program is a success because of the wonderful support and generosity of our community. The holiday season is about being able to give back to the community that has given so much to us,” said Craig Kersemeier, president of K-tech Charities.